My friend sent me this link today- you just click on where your start point is, then where your end point is (you can zoom to street level to see clearly, or put in an address) and the system, ala Mapquest-esque features, creates a bike route for you, incorporating greenways and bike paths. How great is that?! 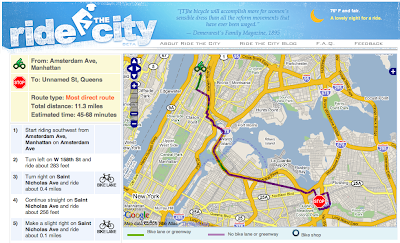 Though the map is available as far as my house, it won't do the directions, I guess for now it's strictly NYC. I really like this idea- I can't wait until more and more bike lanes are in so you can eventually pick a bike lane only option. Sweet.